It may be somewhat early to predict a bright future for Jacob Asiedu Appau, the 16 year old prodigy of Medeama SC (formerly known as Kessben FC) in the GLO Premier League in Ghana. However, the statistics tells me that there has to be something special about this young talented playmaker. I first noticed Asiedu Appau in March 2010 when Young Medeama SC, the youth team of Medeama SC, won the so-called Western Region Coca Cola U-17 soccer tournament, beating Ankara FC in the final. The only goal of the match was scored by Asiedu Appau. Asiedu Appau was adjudged the best player, as well as the joint top scorer of the tournament with four goals. In June 2010 Coca Cola arranged another U-17 tournament in Ghana, the so-called Coca Cola U-17 national soccer championship. Jacob Asiedu Appau finished as the Most Valuable Player of the tournament. 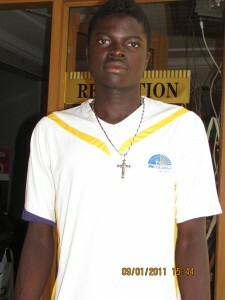 A few months later, Asiedu Appau was included in the squad of the Ghana U-17 national football team. Ghana U-17 was preparing for important qualifying matches for the CAN U-17 tournament. Asiedu Appau was part of the squad that faced Zambia on 29.08.2010 and 11.09.2010 and he started the match against Senegal U-17 on 21.11.2010. Unfortunately, Asiedu Appau and Ghana U-17 failed to reach the final tournament in Rwanda that was played in January 2011. During the last couple of weeks, Asiedu Appau has forced his way into the first team of high-flying Medeama SC, currently second in the GLO Premier League. Asiedu Appau scored his first goal on the GLO Premier League on 02.03.2011, against Arsenal Berekum FC. It’s quite rare that a 16 year old makes such an impression in the GLO Premier League and there is no doubt that Jacob Asiedu Appau is a player to look out for in the following years. Asiedu Appau is apparently born 12.10.1994. He is 185 centimeters and weighs 62 kilos. This information is found on www.medeamasc.com. Asiedu Appau is an attacking midfielder, known for his dazzling skills. Although being only 16, he already possesses a physique that makes him able to compete with experienced players in the GLO Premier League. Medeama SC should be credited for giving young, talented players a chance amongst the big boys. Defender / midfielder Kassim Adams (born 03.01.1993 and 190 centimeters tall) was apparently man of the match against Arsenal Berekum FC earlier this week. Adams has been part of the Ghana U-20 national football team earlier this year and was also member of Ghana U-17 in 2009. Goalkeeper Tijani Musah (born 07.12.1994), a member of Ghana U-17, has already made his full debut for Medeama SC and the lively Joe Paul Asante (born 22.11.1993), also a member of Ghana U-17, has made several positive substitute appearances this season. The picture of Asiedu Appau is taken from www.medeamasc.com.